I am willing to bet that if you have a high end dial or even and advance point and shoot, somewhere on the top of the camera is the mode dial. It has letters like letters like: M, Tv (or S), Av (or A), P depending on the model. The word auto or a green rectangle may also be present representing auto. Lets try to take some of the mystery out of this. 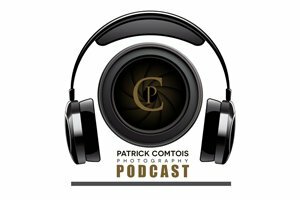 Most beginning photographers set their camera to auto and there is nothing wrong with that. If you like the pictures that auto mode renders, don’t let anyone tell you that you need to change. If you are ready to expand your photographic knowledge and get more creative with your pictures, then the mode dial is for you. Lets look at the different settings. You might think that this mode is pretty self-explanatory, but I would like to offer some insight on this setting. When in auto, the camera will take care of what is called the exposure triangle. In other words, it will control the aperture, shutter speed and the ISO to make the best picture it can. Given the light situation, the flash may or may not fire as well so be prepared for that. In general, auto will make a generally pleasing picture. This setting does exactly the same thing as auto but with a bit more flexibility. This mode also strives to produce the best picture possible but allows you to change certain aspects like deciding if you wan the flash to pop up or not. You can also have some control over the white balance and the ISO so it begins to give you some creative control over the exposure. In addition to that, if you rotate the main control dial, sometimes called the command wheel, you can change the aperture or shutter speed. Depending on which one you adjust, the camera while in programmed mode will ensure the other setting is set to make a pleasing picture. This can be a good way to start experimenting. This particular setting lets you control the depth of field, in other words, how much of the scene is in focus. This is a great tool to have when there is ample light for the exposure. When you want to have full control over the aperture in your lens (and thus also control the depth of field), this is the mode to use. It lets you turn the control wheel on your camera in order to adjust the aperture alone, while the camera decides what ISO (if you use auto ISO) and shutter speed to use.If the light is to low, you many have to raise the ISO to achieve the desired shutter speed. Nonetheless, this mode is great if you want to control the depth of field. Shutter Priority Mode is essentially the opposite. In this mode you tell the camera what shutter speed to use, and let it calculate the aperture and ISO (when using Auto ISO). It is particularly useful if you are shooting fast action like a race or sporting event, because you can set your shutter speed to be fast enough to freeze the motion of the subjects, and know that your camera will select whatever aperture and ISO values are needed to get the shot. This mode always seems to frighten photographers that are new. The reality is that this mode gives you the most control over your camera. 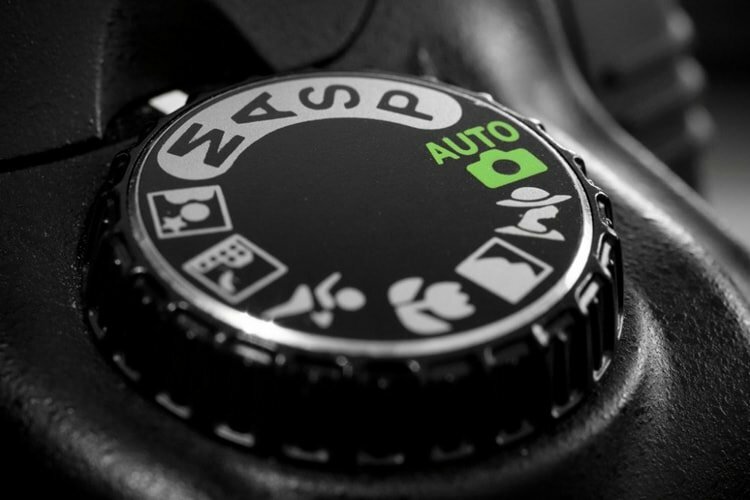 You can control all the aforementioned items, aperture, shutter speed and ISO in this mode. This is the granddaddy of all camera modes, because you have to choose all three settings: Aperture, Shutter Speed, and ISO. Shooting in manual gives you the option of making the correct exposure, but the trick here is to learn to use your camera’s light meter, which will tell you if your picture will be over, or under-exposed. There you have it. Simple explanations of the cameras mode dial. 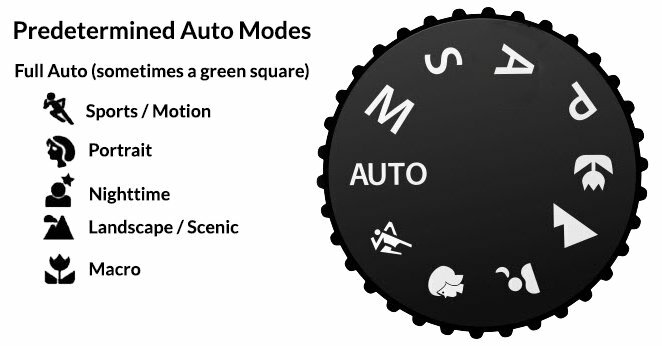 Some cameras come with other modes as shown below, but as your photography advances, these recommended modes probably won’t get used much as you will be able to tap the cameras full potential.